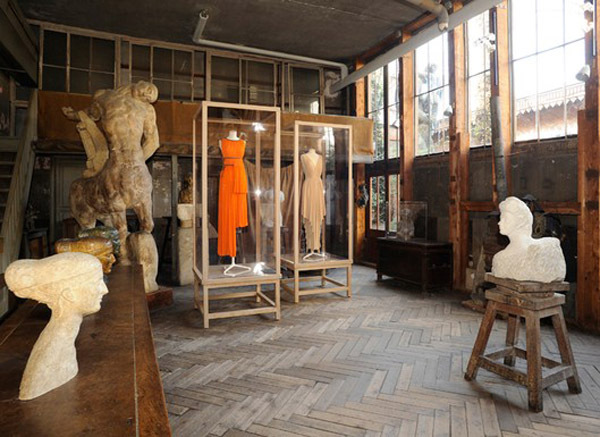 Of the two oeuvres confronted in the rooms of the Musée Bourdelle, it may be Grès’, despite its fragile, ephemeral nature, that seems the most timeless. If it is possible to ascribe a decade to her daywear, her cocktail and evening gowns remain so steadfastly anchored in her signature style that only the slightest details distinguish a pleated dress from the 30s from her sister from the 80s. Any one of those gowns could be worn tomorrow: none could be produced today. It is, however, a pity that amongst the 80 pieces, sketches and photographs by Horst, Hoyningen-Huene, Beaton, Clarke or Bourdin, with their strikingly goddess-like models, the house of Grès’ contribution to perfumery is barely acknowledged in the biographical recap. Perhaps because she herself never thought much of it. In the documentary shown in the exhibition, shot in the early to mid 70s, she is asked about perfume. She dismisses it by saying that it is very different from couture because she can’t do things herself and needs a “chemist”. There isn’t even a bottle of Cabochard on show. In Michael Edwards’ Perfume Legends (at least in the French edition, which seems to be slightly different from the original), Guy Robert, who is also the book’s French translator, recounts a little-known episode of the Cabochard saga. When Alix Grès decided to launch her own perfume house, she first approached Guy Robert to recreate the smell of a flower she’d discovered during a trip to India in 1956, as rich as tuberose but warmer, with cool slightly green top notes. Robert deduced it must be water hyacinth, and composed a perfume around the scent. It was called Chouda, and slated for release as the first Grès perfume. 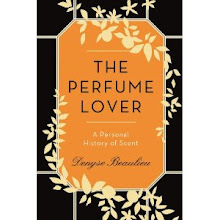 But meanwhile, other labs had had wind of the opening of a new perfume house, and a representative of Van Ameringen-Haebler, which was to become IFF, soon showed up with a sample he’d “filched” from the lab of Bernard Chant, a leather chypre in the style of Bandit, but more floral and rounder. It came out as Cabochard, and was launched at the same time as Chouda. Apparently, Mme Grès didn’t like the former much, but chypres were the rage at the time – Miss Dior and Femme were huge best-sellers in the 50s -- and her sales rep had worked for Piguet, where he’d had great success with Bandit. Chouda soon wilted under the onslaught: according to Guy Robert, only five litres were ever produced, and most of it was used up by Madame Grès. Most: but not all. It just so happens that I found a tiny bottle of Chouda on eBay a few years back. I wrote to Guy Robert to verify that the scent was indeed as rare as he’d said, which he confirmed. 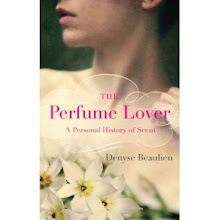 And so, a few drops of the parallel history of perfumery landed in my collection. I've seen vintage Alix Gres pieces last month, famously known for their three-dimensional, sculptural quality. She used the female body as understructure and worked mostly with silk and crepe. I sold my vintage Cabochard parfum, it was an exceptional leather chypre but it felt dated, I couldn't wear it. Emma, they're amazing pieces. I only regretted that only one "toile" was shown... I would have loved to see a garment inside out to understand the structure the pleats were built on. Cabochard is indeed outstanding. I'll need to find another vintage bottle at one point: I gave mine to an older friend whose perfume it used to be, and who was so happy to get some. Now she's used it all up! I wish I had kept my Cabochard bottle as well. I wish Gres was still out there like Vionnet which is doing good in the US right now - characterized by sartorial elegance at such a young age, 14 yr old Hailee Steinfeld was seen in a Vionnet dress (Vogue June 2011). I also went to the Balenciaga exhibition at the Spanish Institute, it was amazing and the line has also experienced a revival under Nicolas Ghesquieres who seems to be Anna Wintour's (only) favorite french designer. Emma, to me Balenciaga and Vionnet are the two true geniuses of 20th century fashion. I saw the Vionnet exhibition four times (including twice with students). Their tutor, my friend B., told them that if they didn't come out of that show with tears in their eyes, they had no business being in fashion. Grès is a great artist too, a creator of form. What always saddens me when I visit these exhibitions is not seeing the gowns moving. There were no films of Grès shows except for the one INA documentary. Thank you for this post! As a costume historian in training, I feel the same way about the sense of movement missing from costume exhibitions. If you can make it to the McQueen exhibition, you will see one billowing coat with a fan blowing on it constantly, and many mannequins on revolving platforms, which introduces a slight element of action that is just enough to convey dynamism. I truly wish I could see this show, especially as Saillard's installation seems to be so interesting. The catalogue, on the other hand, is incredibly frustrating. The pictures of these gowns are so small with all that white space on the page, very design-y, but not helping readers understand the pieces. The text is good though. I've never smelled Cabochard, but now I'm dying to smell Chouda! Sounds like an interesting concept. Billy, how lovely to see you back! Lack of movement is indeed what pains me everytime I see a fashion exhibition. In the case of Grès' gowns, it's particularly a pity since the skirts could reach a width of 30 metres, which obviously doesn't show in a static display. What I particularly loved about the Vionnet show was an animation showing how two pieces were wound together to create a dress: they were also displayed.